Russian oil tanker industry will benefit from increased volumes, reduced congestion, waiting time and demurrage cost at load port; it will reduce the need for Ship to Ship transfers, and improve logistics at the end destination (Rotterdam). Land-based storage solution will reduce risk of environmental accidents and provide reliable uptime independent of weather conditions. 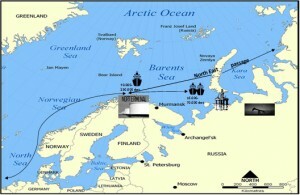 Norterminal will be complementary to the Murmansk area terminals planned, as the total Norwegian/Russian oil production will over the next 20 years require additional Arctic tank terminals. Norterminal will accommodate an increased cooperation with Norwegian oil industry.